The Chestnut Four-Stall Barn has 10'x12' stalls on both sides of a front-to-back Alley for easy access and cleaning. Enclosed floor area is 720 sq. ft. The loft is 480 sq. ft. 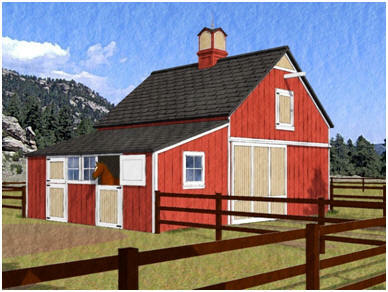 The Shelter shown on the plan is an option that comes with the plan set.